TOP LEFT: Silver Handle is marked "F & B" in a flag (Theodore W. Foster & Bro. Co., Providence, Rhode Island 1898-1951). The cap lifter and wire breaker on the bell is Walker's patent #647775 of April 17, 1900. UPPER MIDDLE: Top of this prong extractor is engraved "Geo. R. E. Gilchrist, Wheeling, W. Va." Marked with number 8 in a shield plus "Sterling 2206, Pat. May 9 '99." This is the M. D. Converse patent #624457. Herb Danziger had a similar one in his 1987 Best Six without personalized engraving. UPPER RIGHT: Piece below handle has the mark of International Silver Company, Meriden, Connecticut. Additional marks are "NX35" and "Sterling." 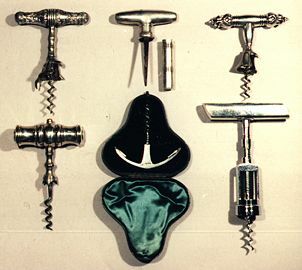 This corkscrew is part of eight piece set in a leather case including corkscrew, cap lifter, muddler, shot pourer, two size stirring spoons and two size cocktail forks. The corkscrew bell also has a cap remover. LOWER LEFT: Heavy silver handle is marked "E S B" and includes Birmingham hallmark of 1900-1901. Cork grips at bottom of shank. Fluted worm. LOWER RIGHT: Art deco handle. Frame with catch above. Marked <J H> and Sterling 10L. Handle manufactured by John Hasselbring, Brooklyn, New York with imported corkscrew mechanism probably from Germany. Hasselbring was founded in 1890 and sold to Crown Silver Inc. in 1954-1955.